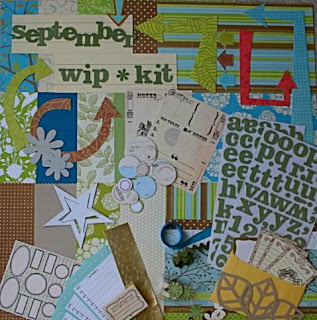 In scrapbook world, Vane told me the sneak peak kit of Work In Progress was up. The guest designer of this kit is Jamie Waters so of course I pre-ordered the kit without seeing it but when I saw it last night I was in love. I can't wait to see what she does with it. The noteworthy stamp is so freakin cute... Can't wait to get it. No clue what I'm going to work on but it's mine for the choosing.. Check it out. I told you it was a great kit!!!! Delicious! Trish at Work in Progress does a great job of giving you lots of goodies. 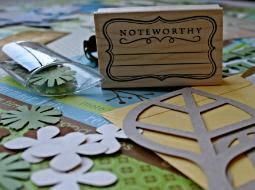 I can't wait to see what Jamie Waters creates next month...She has some really cute LO's on her blog. Hugs!!! P.S. When you figure out a way to get passed this addiction, please let me know. For now, I'm just enjoying the moments...Capturing Life and Creating Art as Ali would say. How gorgeous is WIP's kit??? So glad you pre ordered. They will go soon. I know just how you feel....I "need" it all too!!!! !